Yarn scraps are a fact of crochet life. 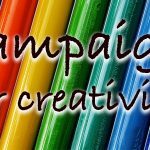 In this article we are going to take a look at some of the handy ways that you can make use of them. 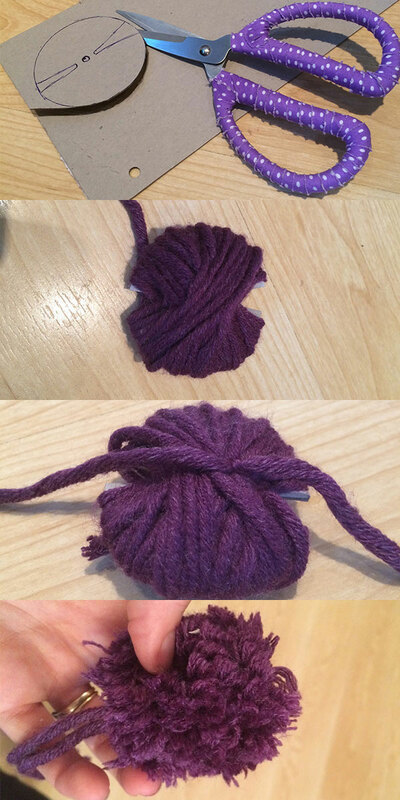 Every time you finish a row or cut off an end, tiny pieces of yarn end up floating around you. And they seem to get everywhere. Stuck to random parts of your clothes, or in our house being turned into a confusing aspect of the toddler’s games. Not to mention driving the cat to distraction. Granny square blankets are probably the main cuprit for me, but more complicated toys where you need to swap colours frequently also produce a surprisingly large amount of cut-offs. Soon after I started my crochet journey I began to wonder what to do with yarn scraps, so as not to waste them. The best way to deal with your yarn scraps is to the collect them up as they are produced. I have a little bowl that sits next to me the whole time I am crocheting, and each time I cut off a yarn scrap I pop it straight in the bowl. When the bowl is full I tip it into a bag, and start using it again. Collecting up yarn scraps as soon as they are produced stops their seemingly magical migration around your home, but it’s not just in the name of tidiness. They can also be very useful in your projects. I tend to separate yarn scraps into three categories, and use them in different ways. These are short yarn scraps, long yarn scraps and yarn left overs. Short yarn scraps are pieces too small to work with. Long yarn scraps are those which can make a few stitches but nothing more. 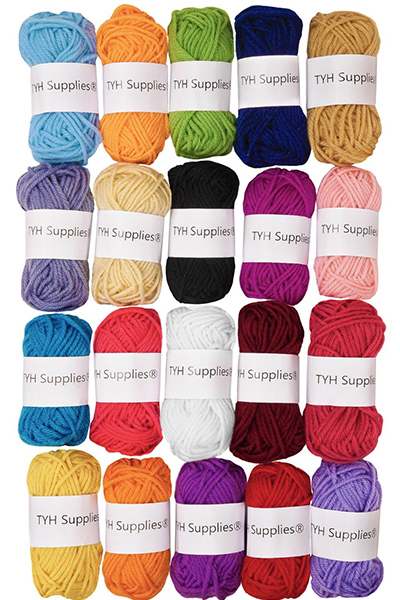 Yarn left overs are the remainders from a ball of yarn, that can be made into small projects or sections of larger ones. Depending on what you have been doing, and how long you have chosen to cut off your ends, your yarn scraps will have varied uses. It’s worth mentioning that not only cut offs go into my yarn scrap bag. I also pop in failed projects. For example, my scrap bag continues lots of ends, three questionable flowers and the slightly odd body and head of what was meant to be a pig (but turned out to be a sort of hybrid guineapig). Very short yarn scraps and failed project can’t easily be remade into a part of a new crochet project. It would take far too long to attach them together or pick the stitches apart. But fortunately they can be made great use of as yarn scrap stuffing. I began stuffing my toys with traditional toy stuffing. It looks like cotton wool and comes in plastic bags. If you are making toys for use by young babies I would stick with this as it’s been tested as safe. However, if you are making asthetic pieces or toys for children over 3 years then yarn scraps are a great way to stuff their bodies. Simply take the smallest scraps and pad them into the body and head in the same way that you would with toy stuffing. 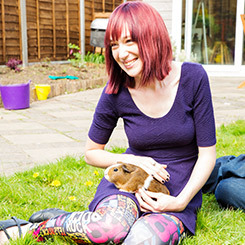 Remember, paler scraps work best for this on pale bodied animals. Try not to use very dark scraps if you have a looser weave or very light coloured yarn for your project, as they might show through. 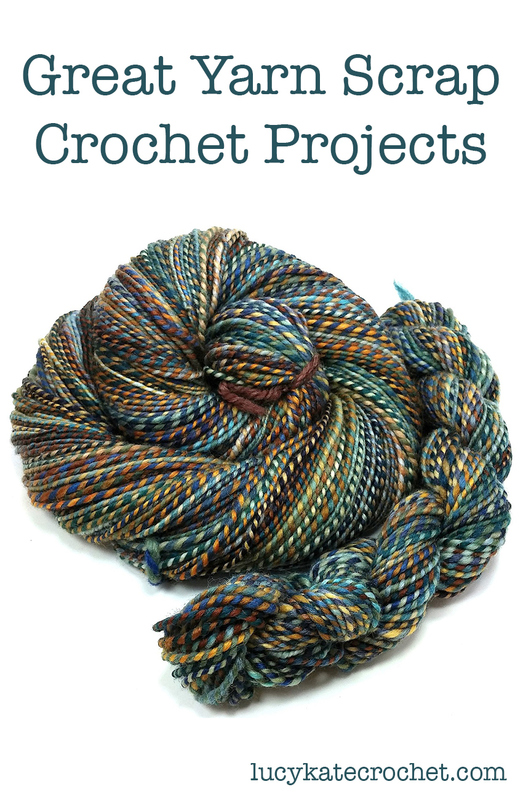 Long yarn scraps can be incorporated into the external parts of your crochet projects. If you cut off or come across longer yarn scraps, then try and store them separately to the general clipped off masses of shorter or untidy yarn. This will make them easier to use later on. Longer scraps can be used for adding details to your work. 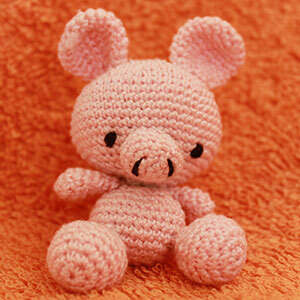 I frequently use yarn scraps as the facial features for the crochet animals I make. Eyes and mouths on smaller toys can be quickly sewn on from your longer scraps. In general black, brown, pink and red shades are the ones I most commonly use for facial details on crochet toys. Just make sure that there aren’t any pulls in the wool that will look scruffy on your finished work. Yarn scraps of any colour can make fabulous details on crochet blankets, throws or cushion covers. Use your long yarn scraps to make embellishments like small sewn flowers, or rows of accent colour within a larger piece. When I refer to left over yarn, I mean the yarn which sits on the ball after you have finished making use of it. Don’t ever throw them away! These remainders of yarn balls are really useful for smaller projects. Tiny yarn scrap toys can be made from left over skeins of yarn. Depending upon how much is left over these can be as big as a regular toy, or as tiny as a pencil topper! Tiny crochet toys can make great party bag favours for kids birthdays, or even decorations or additions to gifts. 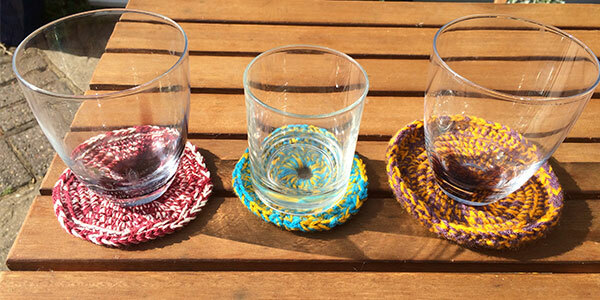 Crochet Coasters are great fun, not to mention practical to have around the house. They make awesome hand-crafted gifts, and can be put together out of relatively small amounts of yarn. If you are unsure whether you have enough, just make as many rows as you are confident you can produce from one color of scrap, then the remainder using another. You can find some great crochet coaster patterns here. Pom Poms are brilliant additions to a lot of crochet projects. They are simple to make, and can be anything from the tail on a rabbit, to embellishments on cushions. They can even make fabulous baby mobiles to hang over cribs. Yarn scraps can be used to crochet baby clothes. Tiny booties and little mittens make wonderful personal baby gifts, and require very small quantities of yarn. Your yarn scraps can be transformed into a gorgeous, useful and very thoughtful gift for a friend’s new addition to the family. Yarn scraps can make fabulous crochet bunting. Various color combinations can make for a fun and cute decorative feature to the wall of your kids’ room or nursery. You can find an easy to follow pattern for crocheting bunting here. Yarn Scraps: In Case Of Emergency! Last night I had nearly finished a row of colour on a granny square blanket I am working on. It was the last of that colour in that yarn type that I had, and I was about two stitches from finishing the row. A little frustrating, to put it mildly. However, I had not tied off and tucked in my previous rows yet. So I cut off the longer pieces, and used them to continue the pattern. It took three or four cut offs to do one stitch, and was pretty fiddly. However, when the ends of those pieces are sewn in and the blanket is finished you shouldn’t be able to tell. And I was able to continue with the blanket. Saving yarn scraps will help you to keep your home, clothes, children and pets free from those pesky random strings that float around all crocheters houses. But it could also save you money, time and help to highlight and improve your ongoing projects. 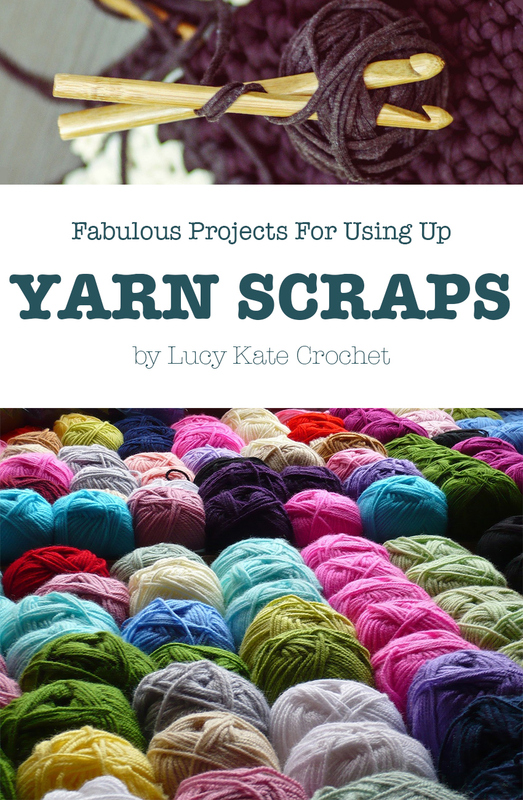 What do you do with your yarn scraps? Why not let us know in the comments box below! I put short yarn pieces in a small bird feeder hanging just off of the porch. Birds use them to build their nests. It’s my busiest feeder! Thanks Janhi, that’s a brilliant idea! Like Janhi, i put them out for the birds and squirrels. I don’t have a feeder (neighbor has cats). I just hang them on bushes and trees. A mockingbird nested in the honeysuckle last spring and I saw yarn bits in her nest. We had to cut down a tree with a squirrel nest and there were yarn bits in it also. I’m a sewer as well as a crocheter and I’ve used scraps of fabric to make pincushions, then stuffed them with yarn scraps. Please don’t leave scraps out for nature. Our animals do a fabulous job and have a plethora of natural materials available for them. The longer pieces they get tangled in and choke and get bowl obstructions with the shorter pieces. …I save all yarn scraps ( even tiny pieces) for daycare kids to use in art projects … it takes very little to make a sun , a tree , grass or even a picture frame decoration …the kiddos love yarn to work with !